The Green and Libertarian parties have automatic ballot access in St. Louis because their candidates collected enough votes in previous elections. Rice and Austin had to collect signatures from registered voters. Gary Stoff, the city’s Republican elections director, said both turned in “well above’’ the 487 signatures required. 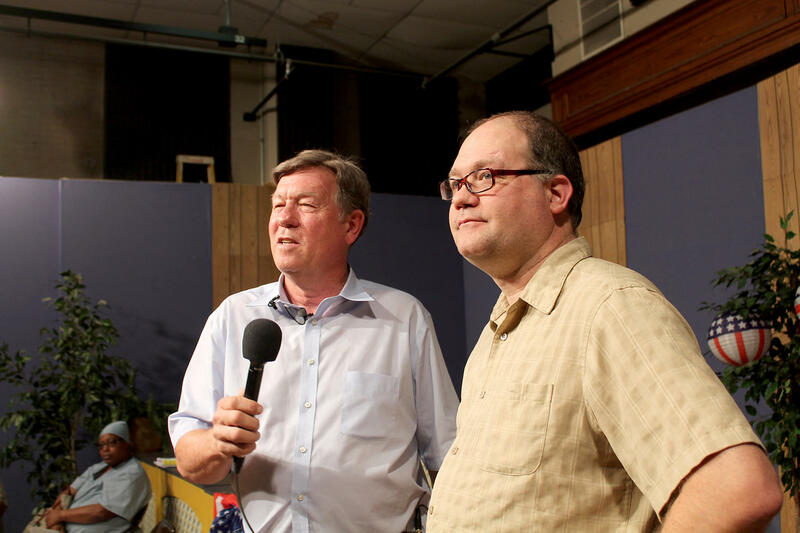 Rice oversees a cable TV station – Channel 24 – and has run a downtown homeless shelter for at least 40 years. He’s often at odds with city officials, and accuses Mayor Francis Slay’s administration of “bullying’’ with their latest plans to shut down the shelter. But Rice says those long-standing fights do have a benefit by making him well known to city voters. Larry Rice, left, joins his son, Chris Rice, at a 2016 news conference denouncing City Hall over its policies regarding the homeless. Rice says he’s running for mayor because he believes he knows best how to deal the fallout from President Donald Trump’s plans to trim aid to cities. “When we start seeing the cutbacks in federal programs which St. Louis is so dependent on, I’m the one with the 45-year track record,” Rice said. "I can actually, with a small budget, help the maximum number of people." This is Rice's first attempt at the mayor’s office, although he ran for governor and lieutenant governor in the 1990s. 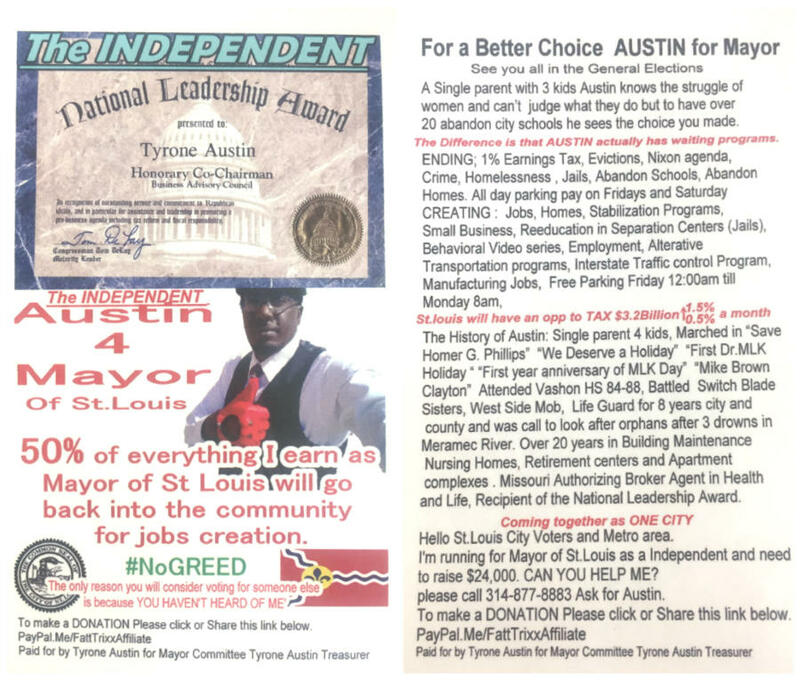 Austin, a businessman, is making his second bid for mayor. The first time was in 2013. He has various proposals to create housing for the homeless and increase the city’s income so that it can eliminate existing taxes. Among other things, Austin is proposing that the city encourage the installation of hydrogen fuel-tank inserts on vehicles, and then tax the fuel when the tanks are refilled. He contends the taxes would provide $30 million a month and eliminate the need for many other taxes. Austin also promises to revamp the city’s 20 or so vacant school buildings and fill them with hundreds of small sleeping chambers, which he says can be rented for $125 a month and provide basic housing for low-income residents. He'd also convert the old school gyms into grocery stores. Cunningham, who makes a living as a saxophonist, calls himself the rock ‘n’ roll Libertarian. “I’m not the purest type of Libertarian. I feel I’m the Libertarian of the future,” he said. His key issue is improving race relations in the city. Though this is his first attempt at the mayor’s office, Cunningham has tried for several other offices on the Libertarian ticket. McFarland calls himself a community organizer. In addition to a campaign for mayor, he’s tried to get elected to the U.S. Senate and the 6th Ward aldermanic seat. McFarland pushes direct democracy, saying that giving people more of a say in their government will make St. Louis a more attractive place to live. McFarland will also push for a community school model, where neighborhood schools also serve as community centers. He also champions redeveloping the city’s riverfront and using the Mississippi River as a source of hydroelectric power.